Meyer applies her lush vocals to some of the finest story songs ever written. Jaymie Meyer, Bistro Award winner, is an actress, singer, writer and spokesperson. She has performed at the Carnegie Hall Weill Recital Hall, The Oak Room at the Algonquin Hotel, the Russian Tea Room and at the Kennedy Center. Her first solo CD, "What You'd Call A Dream" merited reviews in Billboard and Playbill and is being aired on radio throughout the USA and Europe. Wowed the audience with what can only be described as a truly spectacular show! A true artist unmatched by any other singer I've seen this season. "This tall, striking mezzo is something else again. An appealing combination of slinky and straight-forward! "I Got Lost in His Arms," "You Fascinate Me So" and the title song "What You'd Call A Dream" soar to new heights under her excellent execution!" "Each track on this album seems to highlight another sparkling facet of Meyer's talent; crisp, clear enunciation on "Stars and the Moon" excellent vocal control, ranging between diminuendo and crescendo with "The Lies of Handsome Men" immaculate phrasing in "Beyond Compare" and the old-fashioned charm, capped by a superbly sustained ending, in Irving Berlin's "I Got Lost in His Arms." "Elegant and sophisticated singer of this caliber rarely comes along. Warm, mellow, romantic and precise lyric interpretation and gentle nuances show that Jaymie has a deep sense of the very heart of the lyrics, their meaning, their emotion. Add this treasure to your own music collection so you can listen to singing the way it's supposed to be!" A wonderful collection of songs performed with warmth and grace. The interpretations are on the mark on every track. Not to be missed. Add this CD to your collection. This is one CD that I keep in my player all the time so that I can listen whenever the mood strikes me. The lyrics are meaningful and the music is always pleasing to the ear and never tiresome. Jaymie's voice is soothing in the more romantic songs and fun in the satirical ones. I wish she would produce another CD. This is one of my favorite CDs. I have a Random player & find that this CD always manages to stay in my player. A glorious, magnicent CD...Only complaint...Too short! I could listen to you all day, Jaymie. Every time I hear MISS BYRD, you make me soar! Love this CD! The songs showcase a magnificent, first-rate voice. Great selections. First-rate all the way! A true profesional with vibrant personality. A great CD with a variety of excellent selections. The artest sings with expression and personality. Among my favorites in my collection. 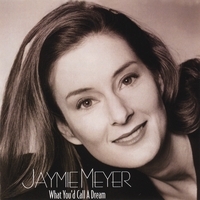 Having watched Jaymie Meyer grow from her roots on Restaurant Row and blossom at Carnegie Hall in a one woman show that brought the house down, finally having a CD that provides a collection of some of her most memorable songs is I call a dream. Hitting a home run right out of the box, the title song strikes a chord with anyone who has ever had a dream and My Mother Was A Singer will bring tears to the eyes of anyone who's ever had a mother. Jaymie's rendition of Ship In A Bottle is unique and marvelous. To those who love cabaret and those who want to find out what they are missing, grab this CD and then grab a seat at Jaymie Meyer's next performance! "A singer of extraordiary style who invariably touches your heart." I was "introduced" to Jaymie Meyer through a friend who knows great songs and great singing. She had heard Ms. Meyer's performance last year at the Algonquin (and, I believe, another one at Carnegie Hall) and she insisted that I get to know this CD quite well. She was right on the mark. In a word, I am enthralled. I'm not a music critic but I know what I like and I like good stuff. By all means, "What You'd Call A Dream" is absolutely dreamy. The selection of songs, including classics like Irving Berlin's "How Deep is the Ocean" and "I Got Lost in his Arms" as well as contemporary gems like "The Lies of Handsome Men," "My Favorite Year," Portia Nelson's poetic and heart rending "It's the Little Things" and others, is wonderfully comprehensive -- and a perfect showcase for Ms. Meyer's amazing vocal capabilities. Her enunciation is always impeccable, her pitch is perfect and her mood is invariably on the mark. I wasn't surprised to learn that Ms. Meyer is an actor as well as a singer. She seems to "perform" her songs in every sense of the word, and you can feel the character that comes through in each and every case. Just listen to the forever fabulous (and utterly captivating) "Miss Byrd" and you'll know precisely what I mean. I've heard this particular song many times, but I have never heard it sound better. These selections are alternately moving, funny, charming, evocative and, in all cases, immensely entertaining. Also, the arrangements and musical support are first rate and always appropriate. Ms. Meyer is a singer of extraordinary style who invariably touches your heart -- in all kinds of ways. I hope she follows up with a second CD. And by all means, may she do so soon. What You'd call A dream is full of life. A wonderful selection of songs that truly speak from and to the heart. I really liked the variation of melodies and Jaymie's voice is rich & beautiful. The cd is also lots of fun and brought many a smile. collection of music performed by an exceptional talent. the heart but my favorite track of all is "Miss Byrd". This CD is a rare treat. Ms Meyer has made an outstanding choice of songs. You will play this CD and never be tempted to press the skip button. Do yourself a favor and add this to your CD collection. Her version of My Favorite Year alone is worth the price of this CD.